Armed with smooth vocals, an Epiphone Casino and the ability to move from smooth, soulful riffs to fiery, gritty lines on a dime, Gary Clark Jr. has solidified his place as blues' golden boy. Most guitarists got their first taste of Clark's knack for stealing the show from his 2010 performance at Eric Clapton's Crossroads Guitar Festival, where he joined Doyle Bramhall II and Sheryl Crow. By the time Crossroads 2013 rolled around, the buzz surrounding Gary Clark Jr. had grown deafening—and the band delivered, once again stealing the show with a high-energy, vibey performance that shone brightly on the festival's already-strong second night. While selling out bigger venues on each tour and releasing the well-received Blak and Blu in 2012, Gary Clark Jr. has been riding a hype train of epic proportions: Gary Clark Jr., savior of the blues, the next Hendrix or SRV, the chosen one. And he backs it up every night, with the help of fellow Austin guitarist King Zapata, a monster player steeped in traditional blues who takes his own turn stealing the show with each tasteful solo. The group is set to turn heads once again for an even broader audience as the opening act for the red-hot Kings of Leon's 2014 arena tour. But despite all of the hyperbole and hype, Gary is a soft-spoken guy who's just beginning his journey into tone-chasing, aided by experienced gearhead Zapata, who turned him on to both the Epiphone Casino and Fender Vibro-King that are the bedrock of his tone. I spoke with him after a fuzz-laden soundcheck to talk about his approach to tone, and helped him come to terms with his burgeoning addiction. "[I need to] try to be a better guitar player before I start putting too many effects on things," he says humbly, then stops and considers his ever-growing pedalboard before adding, "It's so fun though." He talks about taking things backward, to his original pedalboard, but is hard-pressed to choose which new pedals he's willing to part with. "So you are kind of a gear guy, then?" I ask. He smiles, "I just realized that in this moment. Thank you." Add another one to the ranks. Gary Clark Jr., true to his Austin roots, did his time on a Stratocaster before eventually settling on his signature Epiphone Casino. "I'm searching for the perfect combination of round and solid, but not too muddy," he explains, "and it's got to have some sort of a bite. The Casino gives me the biggest range of what I'm looking for." 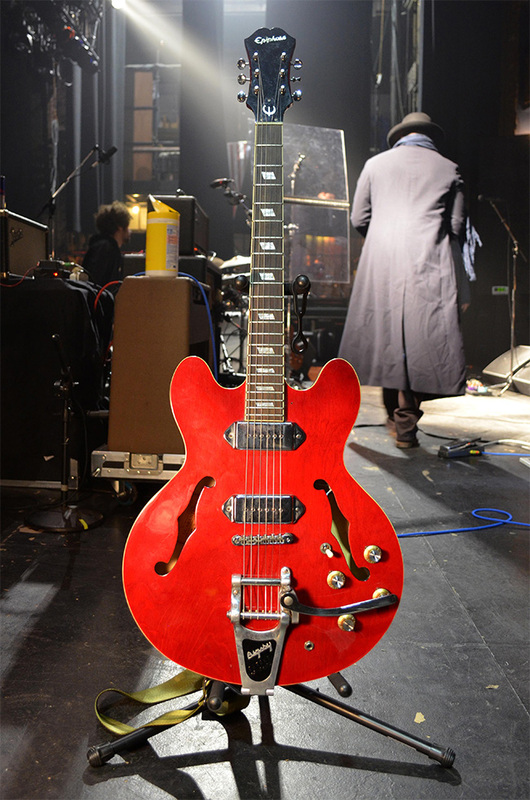 While he recently acquired an absolutely pristine vintage model that he can't seem to put down, his long-time main axe is a cherry red Korean model that he added a Bigsby to. 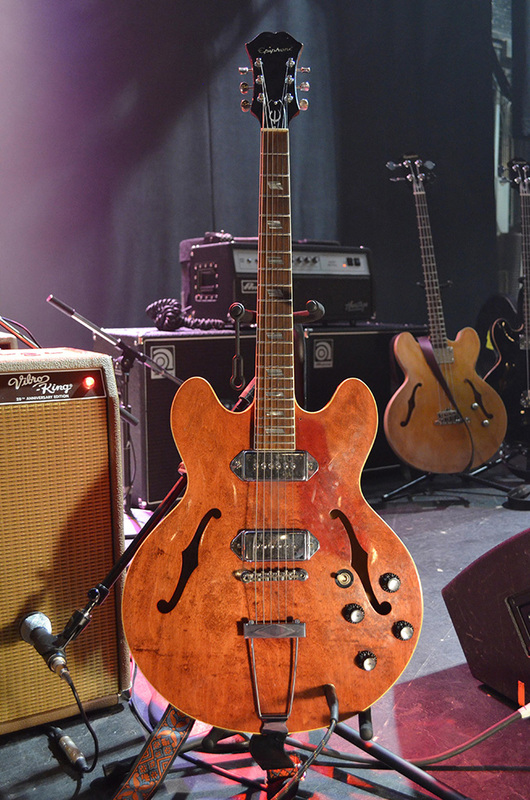 His favorite guitar at the moment, however, is this stock 1966 Epiphone Casino he acquired in London. It's incredibly clean with a worn cherry finish—the original red is visible where the pickguard once was (he removed it). Gary is in love. "It's just kind of set in its ways," he says. "The neck is beautiful. I don't know why it is, but when you put on the middle pickup, it has a cool nasally kind of BB King, T-Bone Walker type of tone. I've never found it on any other Casino. It's special." When he's not playing the Casino, Clarks' next go-to guitar is a stock vintage Tele. Inspired by Albert Collins, he's always wanted a blonde Tele and uses it for "Aint Messin 'Round" and "Travis County." He adds, laughing, "And whenever I'm trying to be Keith Richards during soundcheck." 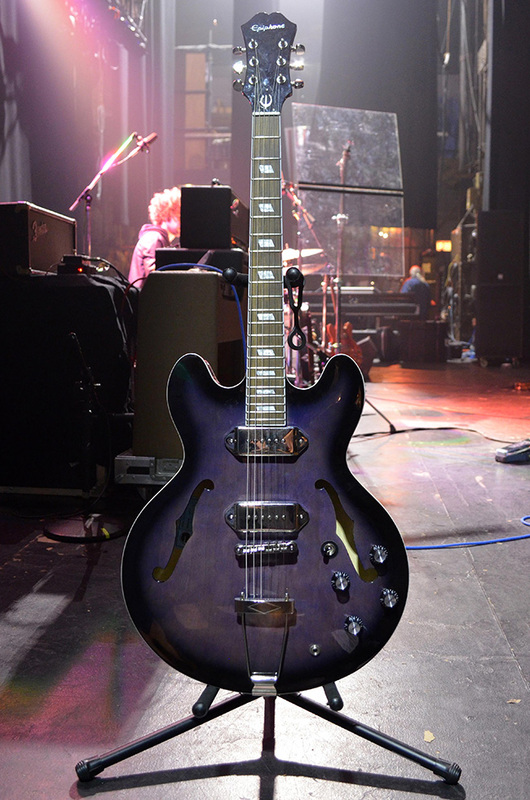 Amongst the other semi-hollows in his arsenal is this stunning blue Casino, a prototype from Epiphone for a signature model. It's currently stock other than the color ("I always wanted a blue guitar since I was a kid," he says), but he's considering making other changes—he's just not sure what. "I just kind of like it as-is. I'm sure i'll come up with something weird." 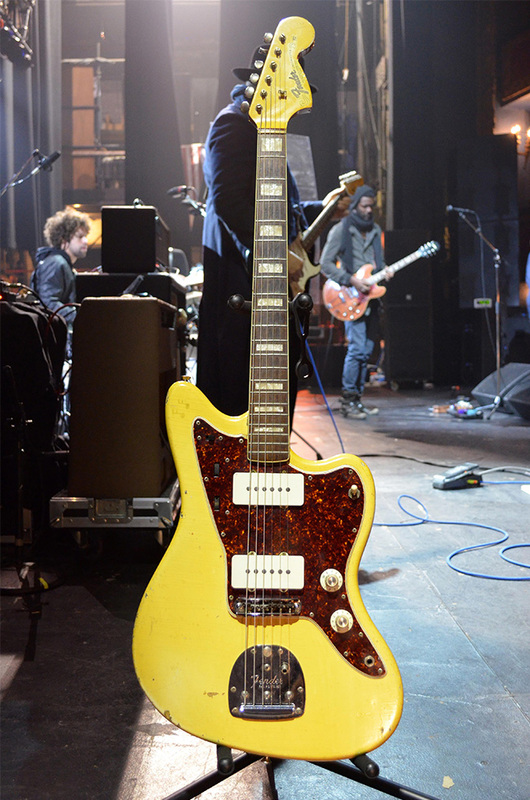 The oddball of the group is a yellow vintage Jazzmaster, which is a whole new feel for Clark. He's still getting used to the guitar, and plays it occasionally on "Third Stone from the Sun" and "If You Love Me Like You Say." 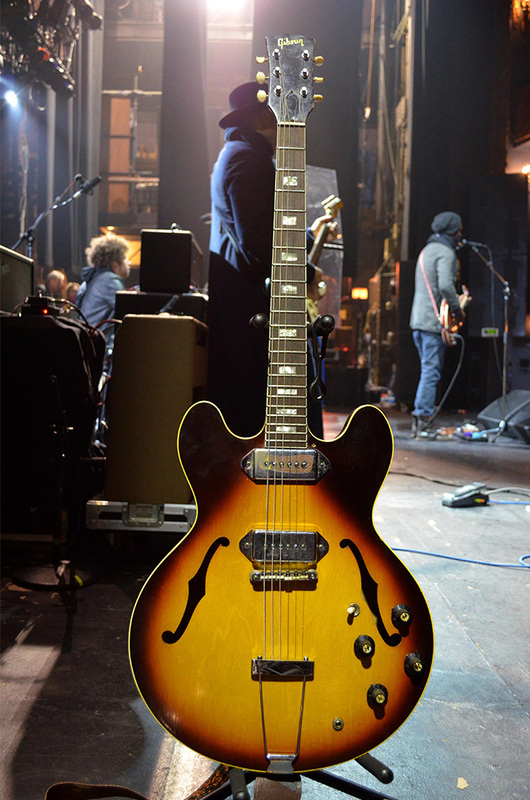 This 1966 or '67 ES-330 is also dead stock, and is currently being used live for slide on the track "Numb." He also uses a late-'50s Gibson archtop for encores (not pictured). He prefers the feel and old-school sound when playing without the band. Clark uses D'Addario 10s or 11s, depending upon the guitar, medium Dunlop picks, and Dunlop glass slides. King Zapata complements Clark's semi-hollowbody tone with his main guitar, a refinished 1963 Fender Strat. A Strat guy ("I'm from Austin," he says, matter-of-factly), Zapata found something special in this guitar. "It's just one of those guitars that everything works on—took me a long time to find that. It sounds good in every pedal, not a typical Strat sound…you can hear my fingers, you can hear me." He also uses a '70s Ibanez Flying V, his tribute to the legendary Albert King, tuned to an unspecified "Albert King tuning," he explains with a smile. "I try not to be predictable, try a different route." Zapata's different routes include contrasting Clark in both playing and tone. "It's too much of the same and it gets boring and unfulfilling." Zapata also travels with a Lowell SG with three Seymour Duncan Antiquity pickups and an Epiphone Doubleneck SG with Seymour Duncan Antiquities. He uses the 6-string in Open A for "Don't Owe You" and other slide work, and the 12-string for "When My Train Pulls In," in a "Skip James tuning." "It's getting hard to tame, all of this madness," says Clark in reference to his pedalboard. His original board was smaller—an RMC Wah, Analog Man Analog Delay, Ibanez Tube Screamer, Analog Man Astrotone Fuzz, and Fulltone Octafuzz—but as his profile increased, so did his access to effect experimentation. Clark's board sees a lot of additions these days, but when I caught up with him, it started with a Korg Pitchblack tuner and custom-voiced Dunlop Cry Baby ("Gary wanted it to sound like it was under water," Holman explains. "It came out perfect."). Next is the Strymon Flint, set for the '70s setting for reverb (it's a little dirtier) and '63 for tremolo. His custom Hermida Audio Zendrive—which replaced his standby Tube Screamer—has a cherry wood box and a hotter voiced midrange and is used as a boost between clean and dirty to warm things up a bit. After that is a prototype of MXR's La Machine, a fuzz with octave control. Clark keeps the gain high and distortion low. Finally, he has a Dunlop Jimi Hendrix Fuzz Face Mini, which he settled upon after trying a slew of different Fuzz Face pedals and clones. 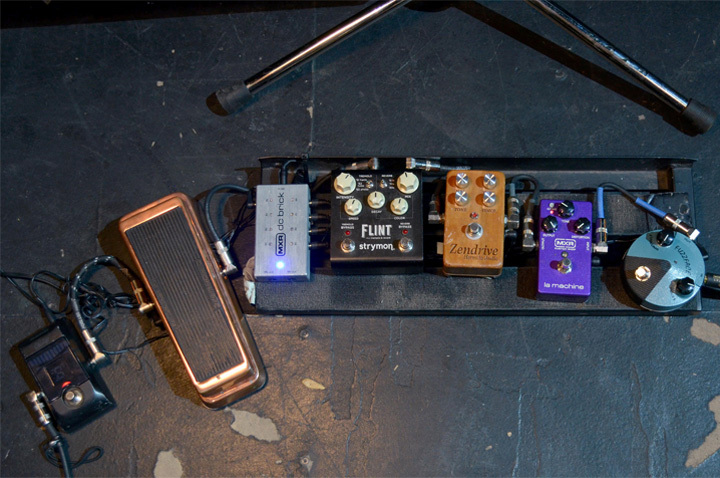 "[This is] the longest evolution of the pedalboard I've seen him with," says Holdman. With all of the firepower at his toes, Clark takes full advantage. "He likes to mix it up. He knows what he likes to go to on certain solos, but pretty much every pedal is used at least once on every song," Holdman explains. While Gary is still wavering in and out of gear lust, Zapata is a veteran of the feeling. During soundcheck, he tried three different pedals on his already expansive board. 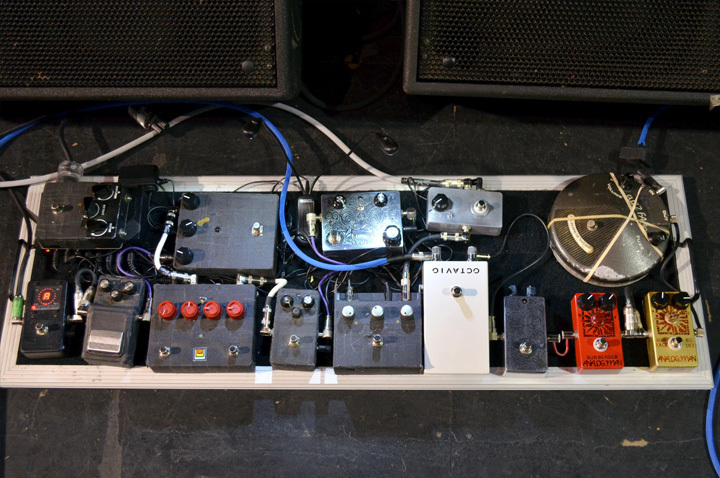 The pedals are largely covered in black tape to keep the board unified and to keep from being distracting onstage. His signal chain is (counter-clockwise, starting at bottom-left) a Vox wah (used like a volume swell, "Almost like a paintbrush with the wall of sound that I create," he says, "I feel like I'm painting with it. "), a Korg Pitchblack tuner, vintage Ibanez AD9, Endangered Audio AD4096 Analog Delay (Zapata likes the infinity switch for ambient parts and the momentary switch for self-oscillation), Moollon Tremolo, Palmer Kaputt Octave pedal, Dunlop Jimi Hendrix Octavio, Moollon Locus Octah, Analogman Sun Bender, Analog Man Sun Face, vintage late-'69 Fuzz Face, Analogman Buffer, and Moollon Revibe. Despite the wide array of options, Zapata says he only uses them here and there for specific songs, other than the Fuzz Face. "The tone is mainly the amps," he explains. On his backline he has a Fender '62 Brownface reverb tank that's always on and an EBS DynaVerb set to Hall. Clark is a Fender amp guy through and through, and the base of his tone is always a Fender 20th Anniversary Vibro-King with Jensen 8-ohm speakers. Clark first got turned on to the tone of the Vibro-King through Texas bluesman Alan Haynes. 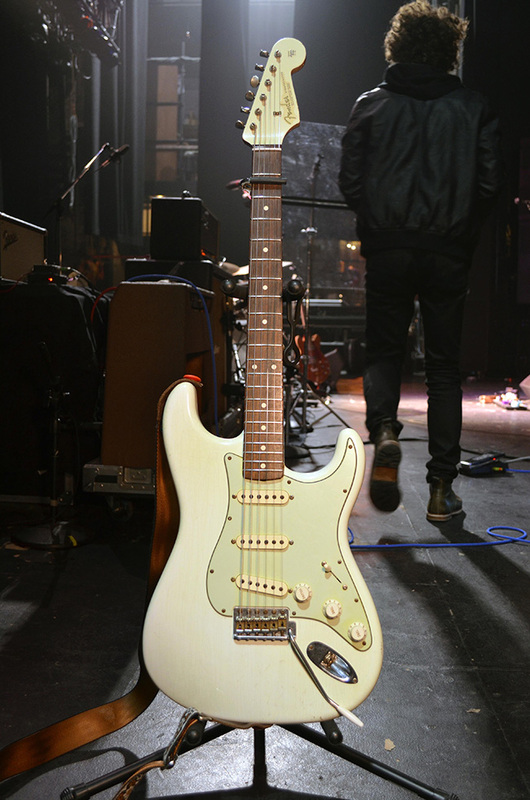 "He has the perfect tone," says Clark, of Haynes' Strat/Vibro-King combination. "[The Vibro-King] bites without being too loud." He prefers the anniversary version because of the point-to-point wiring, and combines it with a Fender Princeton Reverb set up as a slave. 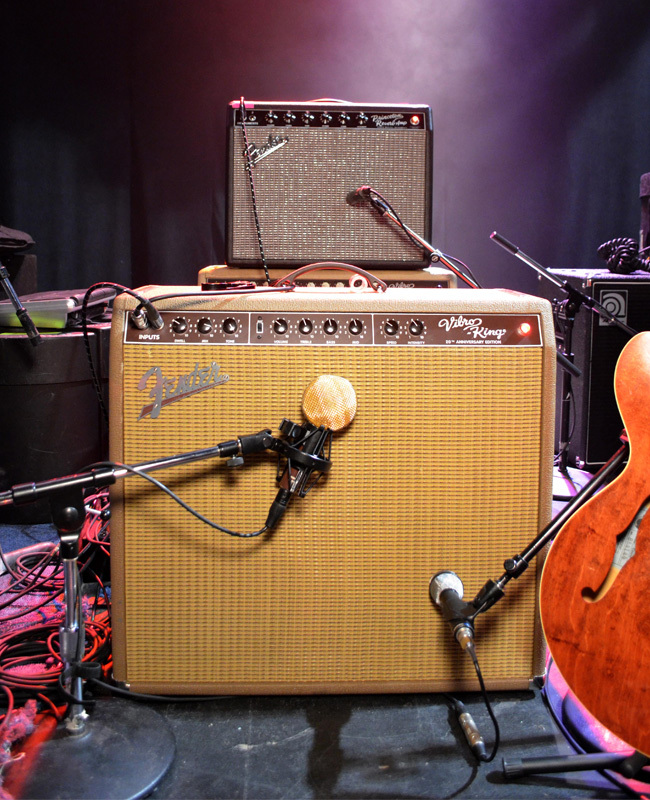 Both amps are always on, though the Princeton Reverb is sometimes swapped for another small Fender model. The amps are mic'd with Cascade Fat Head 2 ribbon mics with Lundahl transformers mixed with a Beyer M69. Front of House man Bareth "Cheex" Ramanath explains that the Beyer is warm, fat, and true to form. "I can accurately image the tones coming out of the amp since they have a nice tone to begin with."